Summer dreams — in a store nearby! 2 Comments on Summer dreams — in a store nearby! W’ve had a bit of a winter pause on our blog here, sorry about that — we’ve been snowed under on all fronts it seems. But life has returned to this stubborn part of the world and any day now the last scraps of snow will melt and we’re in the green. Relief! On the Bokashi front things are happenning too. The message is spreading (gradually!) throughout Sweden as it has throughout so many other countries in the world. This is a real grass-roots movement, a message passed from neighbour to colleague to sister-in-law and one of those few real things you can do in a small way in a small life to make a difference. Like in so many other countries there’s also a huge resurgence in interest in growing your own food. The novelty of home renovation, marble bathrooms and designer kitchens is (maybe? hopefully!) starting to wear off in favour of real things like growing your own food in the backyard. Only the thing is, we don’t want to do it like our grandfather did. God help us, we don’t have the time. And most of us don’t even know how to do it anymore. And we don’t have a spare field. I think Bokashi has a role to play in this: it makes life easier. And better. It makes it easy to fix really REALLY good soil so you can grow your own stuff and watch it thrive. 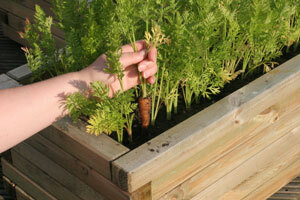 There are lots of other new ways of doing things too, like growing veggies in raised plank boxes. No digging, no weeding. Quite a bit of work up front building them but then once it’s done it’s done. Fill them with Bokashi (from your own kitchen and that of your neighbour!) and anything else you can get your hands on and you suddenly have a fantastic little organic garden outside your kitchen window. This time of year people buy a lot of seeds, we probably all know the feeling of hope when we stand there in the shop with the dream of the summer’s first carrots pulled straight from the soil. But no matter how many seed packets we buy the sad thing is that most of us just end up there in mid-summer with a lot of weeds and some skinny carrots that didn’t turn out anything like the ones on the packet…. Why? Could it be we’re trying to do it the way we remember our grandfather did, but without the patience and love he put into it? Probably without the knowledge either. Definitely without the time. So it has to get easier, we have to find new ways of achieving that seed-package carrot dream! And good soil is the key to it. Bokashi is a fantastically easy and rational way of getting good soil. And if you combine that with smart raised beds, mulch growing and other new approaches. you can say goodbye to the worst of the back-breaking work your grandfather did. And spend time enjoying your juicy fat carrots instead! And here I was thinking our winter was long this year! My carrot seeds are already sown :). I have just started up my Bokashi system again (after a year and a half, life got in the way) and I found you while googling. Great blog! You’re in my rss. Cheers from Holland, where it’s not freezing, but of course it is raining :). Good to hear you’re back on track again! Your carrots will love you for it!! Next Entry Greenhouse Bokashi — also a hit!